Masons Crossing is a waterfront community located in Lake Wylie, South Carolina. Homes range in size from 2500-5000 square feet with 3 bedrooms and 3 bathrooms to 5 bedrooms and 7 bathrooms. In Masons Crossing, you don’t have to sacrifice proximity to get waterfront living. Both I-77 and I-485 are only about 15 miles away, and the subdivision also is convenient to Carowinds, Fort Mill/Rock Hill, and Charlotte-Douglas International Airport. Masons Crossing is currently zoned for Crowders Creek Elementary School, Oakridge Middle School, and Clover High School. 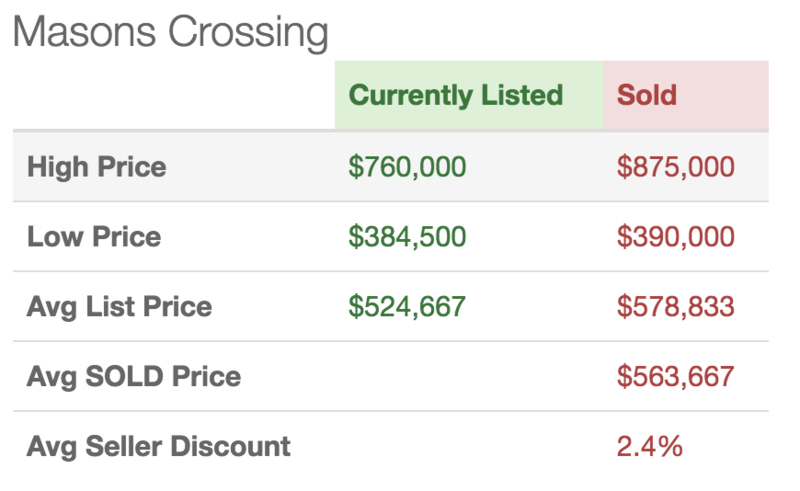 Over the past year, homes sold in Masons Crossing for an average of about $600,00 and $150/square foot. 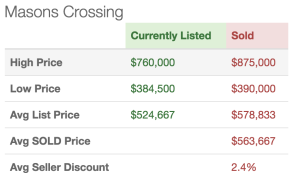 Today, there are 3 homes on the market in Masons Crossing which means there is about 6 months supply in the subdivision. This puts it in line with the area as a whole and means the market in the area is balanced – neither a strong buyer’s market nor a strong seller’s market. While most of the region is a seller’s market right now, Masons Crossing & Lake Wylie is a great place to look for a waterfront retreat, away from the hustle & bustle of Charlotte but close enough to commute.